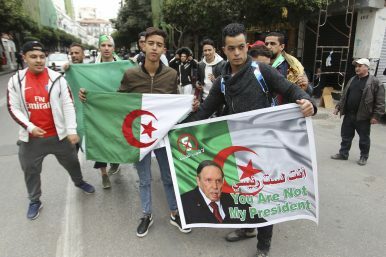 Youths hold a poster of Bouteflika and their national flag as they demonstrate in Algiers, Friday, March 8, 2019. As Friday prayers let out, Algerians gathered in the center of the capital under the close watch of nearby security forces. Holding signs calling for current President Abdelaziz Bouteflika's ouster, carrying Algerian flags and chanting, the crowd began walking down the city's wide boulevards. Algeria and Sudan constitute two of China’s most important markets in Arab Africa. Since 2000 both countries have seen a substantial increase in trade and investment with China. Both countries provide energy exports for China, Algeria alone seeing a 60-fold increase in its exports to China between 2000 and 2017. Together, Algeria and Sudan account for over 7 percent of Chinese imports into the Middle East and North Africa. Chinese FDI in Algeria is 6 percent of the total amount allocated to Africa and Sudan is China’s largest recipient of foreign aid. Such figures illustrate the level of interest on both sides. In addition, both countries have also been among the region’s largest purchasers of Chinese arms. Algeria and Sudan have ties with China that go beyond trade and investment and that precede its current global rise. In Sudan’s case, Beijing had long established diplomatic and political ties following the country’s independence in 1959. Initially, Sino-Sudanese relations were ideologically ”thick” and economically “thin,” a situation that underwent a reversal from the 1990s when Beijing began cultivating President Omar al-Bashir. China also played an important mediating role during the Darfur crisis after 2003, when Beijing persuaded Bashir to accept a UN peacekeeping presence. China’s leaders have continued to stand behind Bashir, hosting him at its Africa summits, despite the International Criminal Court issuing an arrest warrant on charges of genocide in Darfur. China’s connections to Algeria go back even further. In 1958 China was the first non-Arab country to recognize the National Liberation Front and provide it with arms and funds in its struggle for independence. Following independence in 1962, China provided soft loans and other forms of assistance, including medical missions to the new government. When China eventually joined the UN in 1971, Algeria was one of the co-sponsors that proposed the resolution. Today, Algeria has one of the largest Chinese communities in Africa and the Middle East, at around 70,000. Given the historical and economic importance of Algeria and Sudan to China, then, what may be the impact of the current protests taking place in both countries on their relations with China? They began in Sudan in December following bread and fuel price rises and in Algeria last month, when President Abdulaziz Bouteflika announced his decision to run for a fifth consecutive term. Although Beijing does not appear to have made any public statements on the protests, it will be watching closely. Even though China’s foreign policy principles include respect for other states and noninterference in their internal affairs, it is fearful of disorder and instability and what that may mean for its interests in either country. Here it may useful to consider China’s response to an earlier period of regional unrest: the Arab uprisings in 2011. Then, the region was swept by a wave of protests similar to those that are taking place in Sudan and Algeria. Frustration at rising prices and a lack of economic opportunities prompted many to take to the streets, first in Tunisia, then Egypt, Libya, Syria, Jordan, and Bahrain. Along with the influence of social media and transnational news channels like Al Jazeera, the people’s demands began to morph as they targeted the regimes that they saw failing them. Several dictators fell, including Ben Ali in Tunisia, Mubarak in Egypt, and Gaddafi in Libya. Soon though, other regimes, like those in Syria and Bahrain, were able to halt the protests by force. That approach was echoed by the Chinese leadership, which similarly squashed any dissent or sympathy at home for the protests in the Arab world. At the same time, Beijing criticized the West for what it saw as attempts at external intervention to remove leaders like Gaddafi and Assad. Despite their regional scope, the 2011 uprisings largely passed Algeria and Sudan by. In Algeria, large oil revenues were used by the government to pay higher wages, thereby limiting dissent. But now the situation looks bleaker. Underlying the current protests is economic frustration: not only have export revenues fallen as a result of declining oil prices after 2013, but the government remains overly dependent on hydrocarbons and has failed to diversity economy activity. Meanwhile, unemployment remains a pressing problem: a quarter of people aged under 30 are without work. Similarly, in Sudan the government has not been able to overcome the loss of most of its oil fields following the country’s partition with South Sudan in 2011 while the cost of living, including bread and fuel prices, has risen. At present there are three possibilities for how the current protests may unfold. One is that the governments are able to overcome them. But to do so may well mean them resorting to repression. Indeed, Bashir has already been using this tactic. If he is ultimately successful in curbing protests and continues in power, it would be at the cost of his public standing and questions about his legitimacy. A second option is that the regimes decide to act and remove Bashir and Bouteflika. The advantage of this approach is that it could draw the sting from the protests. The regimes will survive and claim that they have undergone a process of renewal. A disadvantage, however, is that by focusing on the removal of the president, they may overlook the reasons why the protests happened in the first place and fail to tackle their underlying causes. That will leave the public continuing to be frustrated. The third option is that both the presidents and the regimes are defeated and replaced. The danger with this approach is that it is uncertain what comes after. In Tunisia, despite some political turbulence, some progress has been made in establishing a more democratic system. By contrast, Gaddafi’s removal in Libya and Saleh’s departure in Yemen led not to unity but fragmentation. Given China’s previous stance during the 2011 uprisings, it would perhaps favor the third option least. The other two would provide constancy. But regardless of which option is the more probable, based on China’s stance in 2011 and since, it will likely support the governments as they try to restore order. At the same time though, China’s fears of uncertainty may well be unfounded. Regardless of whether a regime survives, dies, or renovates, China’s economic global importance is now substantial and significant enough that its interests in either country or the wider Middle East cannot be disregarded. Throughout the region, China’s relationships with individual countries are asymmetric: its exports outweigh its imports and Chinese capital and finance in the form of its Belt and Road Initiative is attractive to the region’s governments, which aim to stimulate and develop their economies. Consequently, whatever governments eventually emerge in Algeria and Sudan, they will not overturn the bulk of previously established projects and activities with China; they may even compete to gain Beijing’s attention. But even if China and regional governments are of a like mind, Beijing’s present stance could cause it more long-term problems among the Algerian and Sudanese populations. Arab populations have observed American hypocrisy in the past, especially its rhetoric for liberal democratic ideals on one side but support for the region’s authoritarian regimes on the other. If China continues to be quiet despite its present outsized influence, populations may similarly come to see Beijing’s interests as entwined with the region’s autocrats rather than with its peoples. *Guy Burton is Visiting Fellow at the Middle East Center at the London School of Economics and Adjunct Professor at Vesalius College in Brussels.